NECKLACE/PIN - SARAH COVENTRY. "MAGIC MOODS" FROM 1973. 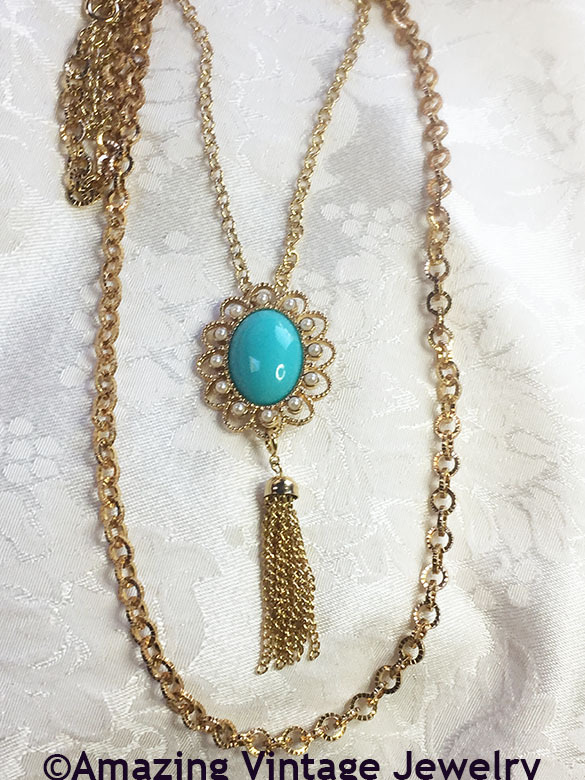 DISTINCTLY VINTAGE IN FEEL, THIS GOLDTONE PIN WITH OVAL TURQUOISE-COLORED CABOCHON CENTER, SURROUNDED BY FAUX PEARLS AND ENDING IN A GOLDTONE CHAIN TASSEL, CAN ADD A LITTLE MAGIC TO ANY OUTFIT. 1 5/8" LONG, 1 3/8" ACROSS. DOUBLE CHAINS ARE THE ORIGINALS THAT WERE SOLD WITH THE PIN...22" AND 32" LONG. 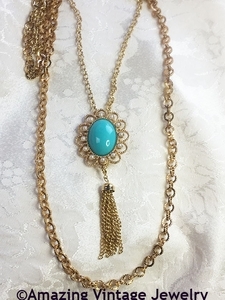 PIN CAN BE WORN SEPARATELY WITH OR WITHOUT THE TASSEL. EXCELLENT CONDITION. VERY RARE TO FIND THIS ITEM WITH THE PIN AND BOTH CHAINS INTACT.